Keep the whole family well-caffeinated this holiday season with the Seattle Coffee Gear Drip Coffee Starter Set! We built our brewers bundle with one goal in-mind: Easy coffee for the busiest time of year. We started with the Bonavita Metropolitan, our most-popular entry for drip coffee enthusiasts. The Metropolitan combines excellent brew temperatures with a wide spray head and available-anywhere flat bottom filters—just the thing for effortless coffee. We matched the Metropolitan with another favorite, the Baratza Encore. 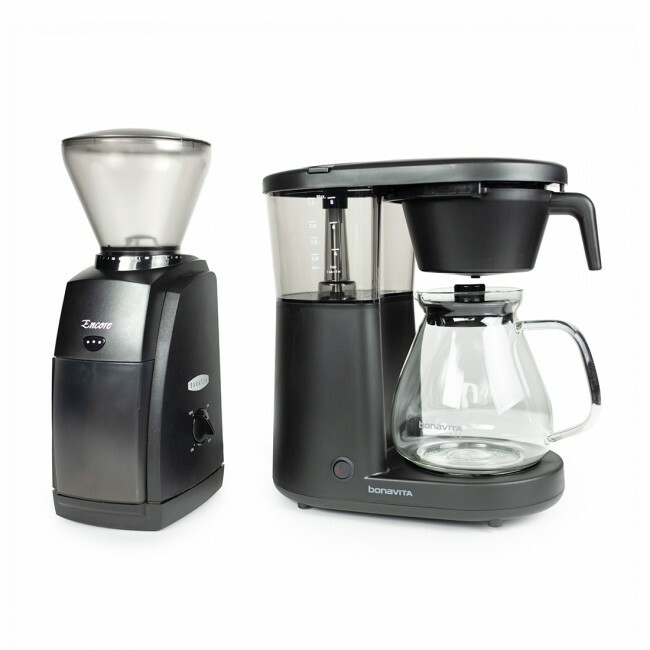 Built with home brewers in-mind, the Encore offers easy stepped grind settings, simple on/off controls and unbeatable grind quality at its pricepoint. Together, you're only minutes away from a fresh pot of coffee—just the thing for those late-night wrapping sessions. Stable Temperature - Calibrated for temperature consistency, the Metropolitan brews at a steady 200° for even extractions. Wide Spray Arm - A 12-hole spray arm offers even wetting for the flat-bottom basket. Optional Pre-infusion - Press-and-hold the power switch for 10 seconds to activate a quick pre-infusion before brewing regularly. 40-Ounce Capacity - A 40-ounce capacity balances well with a 5-minute brew time for quick, repeatable cups of coffee for a crowd. Conical Burrs - The Encore packs in some high-quality steel conical burrs that make short work of beans without creating too many fines. 40 Grind Settings - A stepped grind adjust offers excellent feedback and easy-to-remember grind settings for your favorite beans. Automatic or Pulse Grind - Run the grinder automatically with the side-mounted power switch, or pulse grind with the front-facing button. Looking for an easy entry to quality coffee at home? This is your pick. The Metropolitan is just tall enough for 10-cup Chemex brewers!